Doom authors are pretty content to stay within the confines pioneered by the IWAD levels. 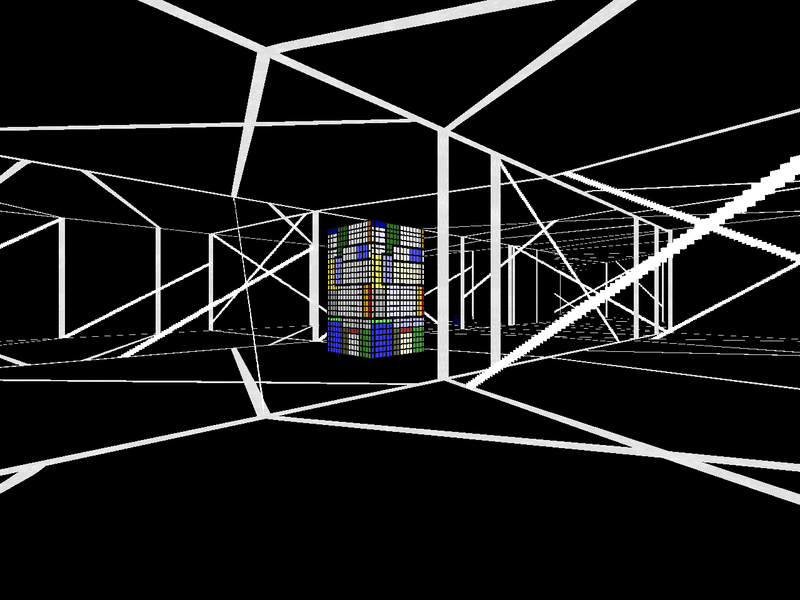 The original gave us Phobos, Deimos, Hell, and E4, while Doom II showed us starbase, city, and... even more Hell. Now and then, more novel settings appear, and every once in a while someone throws us all for a loop, like Didy and B/\|_||-|/\|_|S. 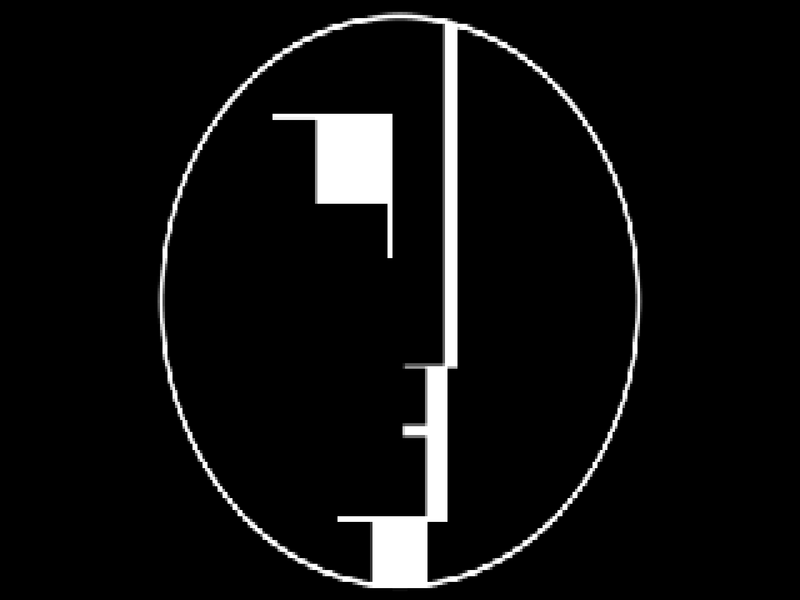 Bauhaus is named after what else? but a German art school active between World War I and World War II, the name literally translating to "house of construction". The focus on art rings true to Didy's sensibilities, given that the goal of his Monster Hunter, Ltd. dirty pair was to recover a lost work. 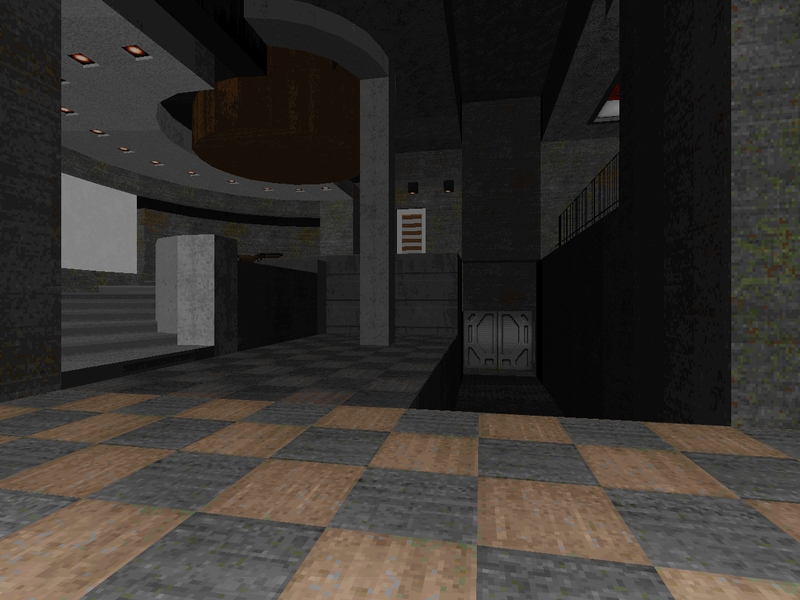 After a cursory reading of the relevant Wikipedia article and some scanning through pictures, I am inclined to believe that Didy performed a successful translation of the Bauhaus style into Doom maps, but there are two very distinct stages of his execution. The first and most obvious is his mimicry of actual Bauhaus building design in the various villas that appear in MAP01 and MAP02. Well, to be fair, the smaller dwellings of MAP01 and MAP02 feel more like Bauhaus-inspired modern architecture as the more personal houses contrast against the various buildings and apartment complexes that dominate the golden age of the architecture school, but I'm probably splitting hairs since the movement has enjoyed a profound influence on modern design. 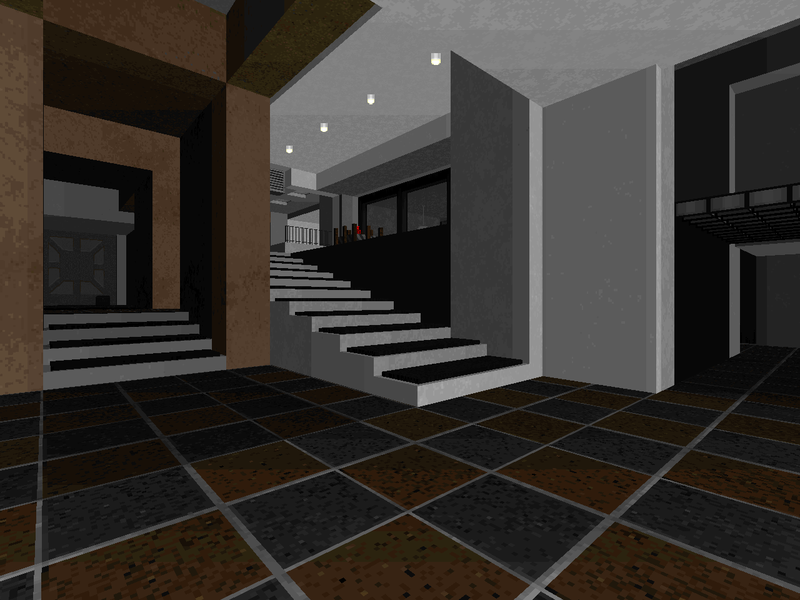 The other stage takes this experiment to its logical end as Didy takes the principles of Bauhaus and extends them to actual level design in MAP03 and MAP04, though you get a taste of it in the beginning of MAP02 as you kick around the main building's basement. In the course of applying the core design elements, the author completely sheds the naturalistic surroundings that set off the houses, instead keeping the action almost entirely indoors in abstract playgrounds. There is no sense of the facade of habitability that characterizes the structures of "Bauhaus 1" and "Bauhaus 2"; instead, the execution reflects a pure marriage of functional level design and art principles. 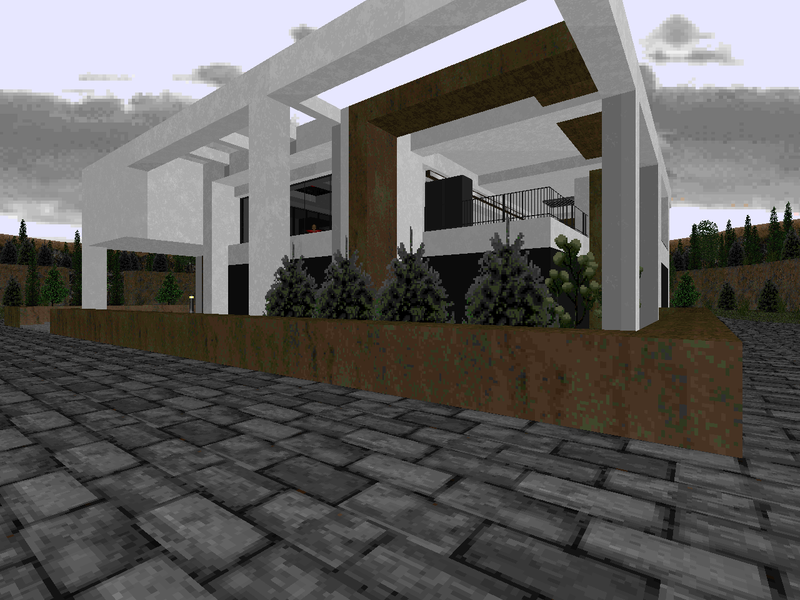 As Bauhaus attempts to combine architecture, aestheticism, and humanistic utility, Didy's MAP03 and MAP04 serve as buildings devoted to the ultimate purpose of Doom: kill all the demons, solve all the puzzles, and exit. The only thing lacking in the second half is a sense of outside space. 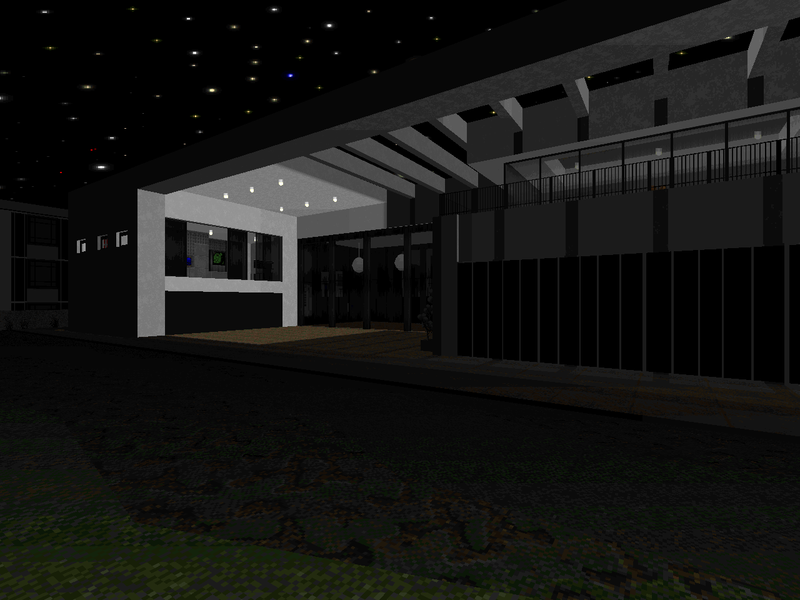 Sure, there are a few glimpses of starry sky, but the Bauhaus style seems like a natural fit for Doom's large, exterior areas. Was Didy over-cautious of evoking the look of the buildings showcased in "Bauhaus 1" and "2"? There is some fantastic, Doom-worthy architecture that has yet to be seen. 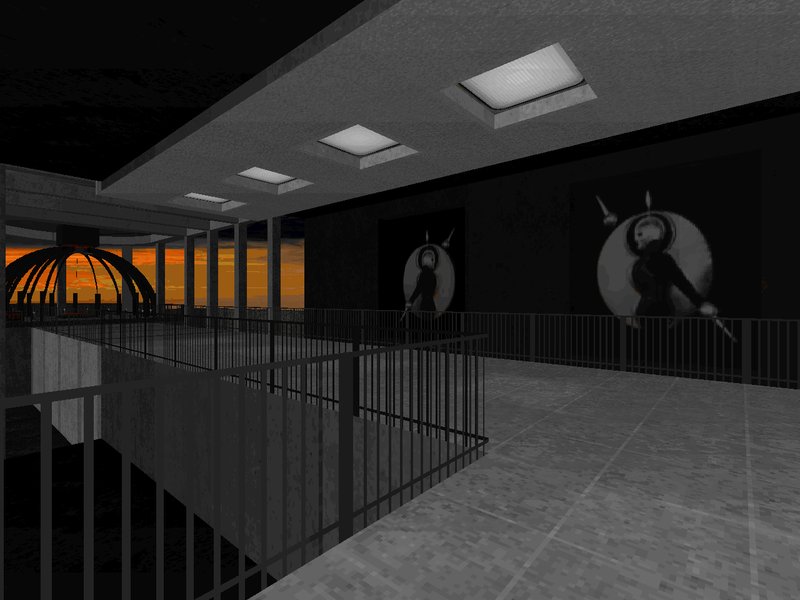 The Bauhaus-Archiv is a perfect example of something that, to me, could have come from any sharp-looking modern Doom mapset. It's got plenty of ledges for monsters to hide on, an upper walkway for some height variation, and a very distinct profile with the roof...which would probably have to be accomplished via some midtexture trickery. 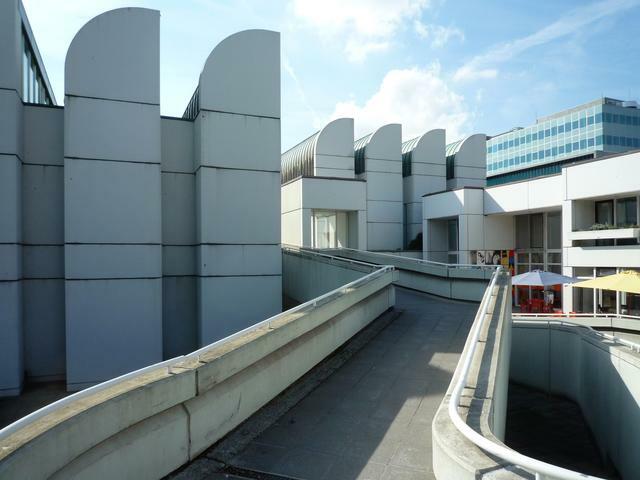 I'll admit that some of the crazier Bauhaus buildings are more suited to true 3D architecture, but Didy's done so great a job it's a wonder he didn't lend his purest experiments some room to breathe in. While Doom and art may seem strange bedfellows to those more suited to blowing away hordes of Hellspawn, it's no stretch. Some may find beauty in detailing, but in my Doom world, architecture is king. 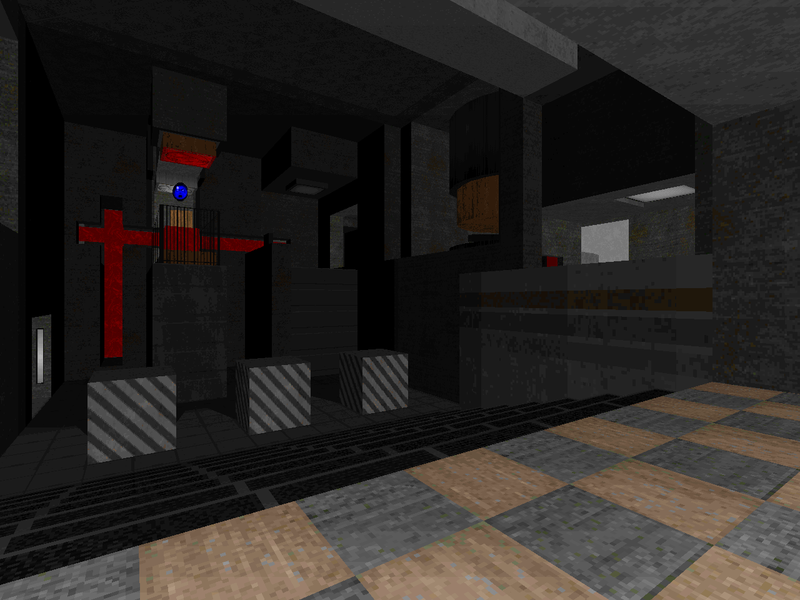 Granted, a map's ultimate purpose is to present a series of obstacles between the player and the exit switch, but just about anyone can throw some sectors down with some ammo and monsters and call it a day. The most memorable levels pair fantastic visuals with engaging firefights. If you've ever wondered why my screenshots are almost always devoid of monsters, it's because I think that the art of level construction appeals much more readily when it's been purged of scene-stealing demons, and I hope that their suspicious absence tickles the imagination of prospective players. 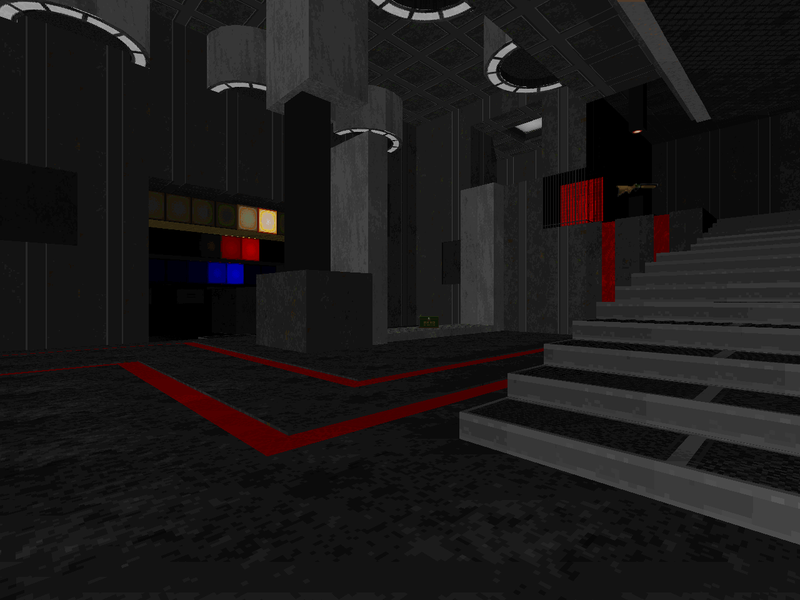 Every Doom level has its roots as architecture, though as artists working within a digital medium, authors need not consider the practicality of their structures as it relates to habitability, or whether they even obey the laws of physics. Their only limitations are dictated by the engine they design for, so that they are free to pursue a perfect unity of form and function if they so desire. A school of mapping exists that harps on this relationship, whittling away at all the vagaries of PWADs to create an unmistakably professional final product that betrays nothing but its commitment to "playability". The end result is a map where the only intended stumbling blocks are the monsters themselves. Bauhaus the PWAD escapes these pitfalls largely due to its puzzle play but also through the odd inclusions of wall-art and geometric sculptures, all of which go a long way toward differentiating it from the absurd extreme of monster-laden racetracks. It's... quirky, and I mean that in the best way possible. Many of its elements of level design evoke something more akin to virtual reality playground / laser tag arena meets art gallery, and I don't think you could shoehorn it into one of Doom's stock themes without acknowledging the essentially abstract nature of ALL Doom level geometry. Didy's Bauhaus is distinctly its own. While being Didy, of course. 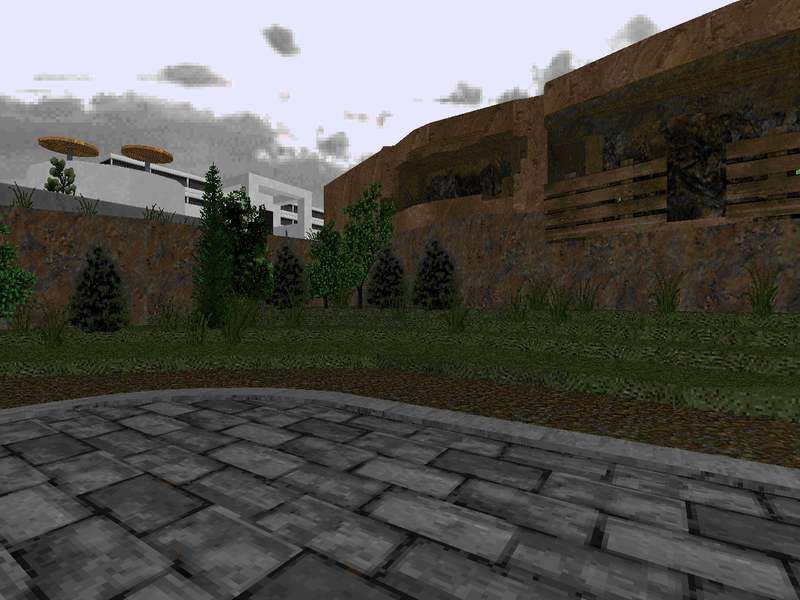 Bauhaus's gameplay is dependable, if not earth-shattering; its main draw is as a study of the style and its principles as depicted in Doom. I think that the sheer novelty of its setting is enough to earn it a place in this community's history, though whether that interests players enough for them to try it out remains to be seen. All I can tell you is that it is certainly worth a look. A neat opener that shows off the Bauhaus style in a handful of isolated mountain villas. The combat is very light and ammo very plentiful though you will have to best some mid-tier monsters like revenants and mancubuses. It took me a good while to realize that the red switch had surfaced in the square chamber. I think the resulting fight inside could be a bit stronger than an imp in each corner. 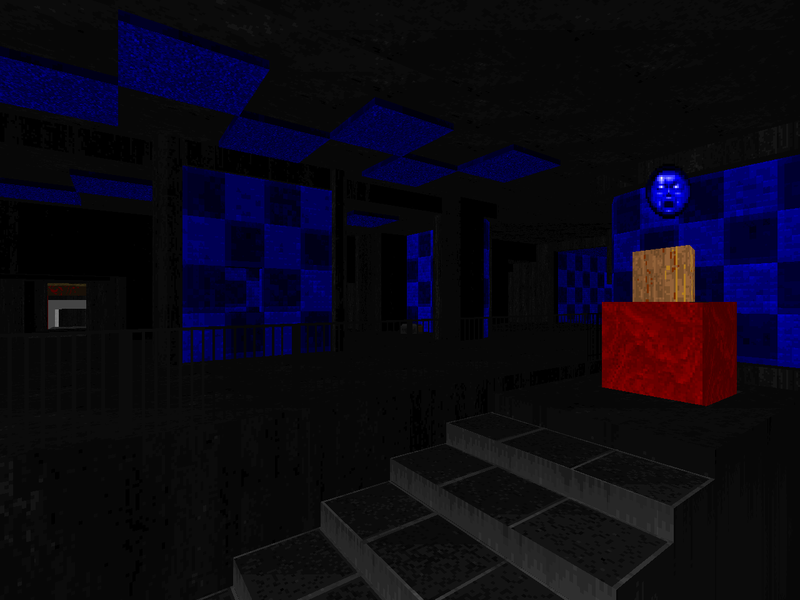 This time you're treated to a more abstract deep blue basement section. The shotgun and super shotgun are readily available so it turns into some light skirmishing. You'll want to make off with the rocket launcher before you go upstairs into the main building. There are imps and a mancubus lurking outside and are pretty much the most threatening things on the map outside of hitscanner surprise attacks; in spite of looking Escher-ish there is plenty of room to move around, enough to dodge revenant rockets at least. The finale has some great infighting potential, letting the arachnotrons do all the hard work for you. A more intricate underground labyrinth full of interesting layered architecture that transforms and opens up to suit the author's purposes for progression. A lot of the action is still dominated by combat shotgun skirmishing but Didy steps up the difficulty with the inclusion of a handful of arch-viles, with the nastiest run beginning at the red key door and continuing to the end, sending you on a crawl through infested territory as you pick off the demonic sentinels one by one, culminating in a potentially troublesome teleporter wave. This is along the lines of "Bauhaus 3" but this concrete nightmare is much larger and while you won't be hurting for ammo the only real health pickups are soul spheres that require some rudimentary puzzle-solving / switch-hunting to unlock. The layout is bewildering at first given Didy's proficiency for multi-layered tiers of play and all the lifts but you should be able to get a handle on it since the style leaves you with a number of distinct areas with some pretty cool set pieces, like the chess board sculpture blocking the "I" cube, whose area also has a bunch of cool transport tubes that are the key to navigation. Nasty surprise Cyberdemon, there. After playing MOHU1 & 2 first time last month, I didn't expect Bauhaus to quickly replace them as my favourite Didy wad. It simply clicks all the right buttons for me, especially MAP04, which at first appeared dauntingly non-linear but each exit icon was in self contained areas and flowed along nicely. UV felt just right, nothing unfair but several encounters still got me on edge. Once again, I look forward to his future releases. 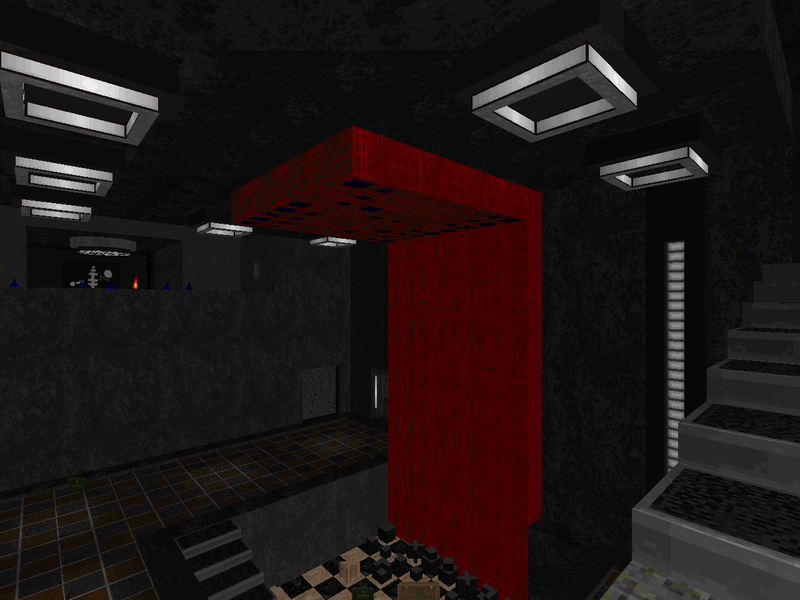 It's worth revisiting the map with GZDoom or Doomsday... You'll be surprised. Good review and also good job I should say in giving priority to the years top wads. :) Once Mayan Mishap goes up, every top ten and runner will be on here. As 2015 gets off to a start, is it possible you might look to unearth some more 90s forgotten gems? I'd love to see more surprises like INVADE2 (a candidate IMO for the best map of 1994). when i get the time i am going to dig back into the 90s period. i also want to kind of build back from 2011 to 2010 tho and explore a lot of the stuff that i didnt get to in 2012 and 2013. The idgames archive link is to Congestion 1024, is that intentional? nnnnnnno, lol. i copied an /idgames button from the 1024 article and then changed it to a pending button as the non-release continued, without scrubbing the link. fixed, thanks! Interesting review. Bauhaus works as well as it does, I think, because Didy recognized that the essentially abstract geometrical wonderlands that characterize (and to some extent, are necessary for) combat and traversal in conventional modern Doom maps share something of an incidental kinship with idealizations of the clean, efficient, space-conscious sensibilities of the Bauhaus movement; a happy coincidence that two of his interests happened to intersect so neatly. Interestingly, in comparison to many of Didy's other maps, the sense of adventure and even exploration is less pronounced in these (being replaced by some quasi-puzzly setpieces instead), and they do seem to focus a little more on 'conventional' arcade-style combat than is his usual wont; it mostly works okay because the design philosophies are so neatly in sync, though his relative unfamiliarity with that style of action shows once in a while--for example, THAT cyberdemon in map 04 almost made me soil myself, which is something I heartily approve of, but after the initial shock it turns out that the setup of the encounter means that he is very easy and not very fun to actually fight. Despite the relative shift in focus, then, it still ends up being Didy's usual penchant for atmosphere that really helps him pull Bauhaus off...I thought it was cool the way the architecture and color schemes and such become gradually more and more outre and grotesque and perhaps somewhat caricaturial the deeper one gets into the mapset, to the point where a lot of map 04 seems genuinely sinister, albeit in an off-kilter sort of way. A neat, subtle spin on the classic earth-somewhere-HELL progression, certainly. Incidentally, I think you'd enjoy a lot of Didy's older stuff; it's generally less tightly orchestrated but also more expansive and freewheeling than his crop of maps from this year. 'Sine Die' is probably my favorite of these, I reckon. At this point, while I love the adventure and detail of MOHU 1&2, I feel that Bauhaus is the more significant work.